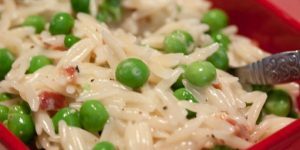 This quick stove top Orzo Alfredo is perfect for nights when you don’t have a lot of time or don’t want to heat up the oven. The combination of cream, butter, and Parmesan cheese creates a fantastic homemade Alfredo sauce. Calories and fat could be reduced by using milk and/or half-and-half along with some cornstarch to thicken the sauce instead of using cream. 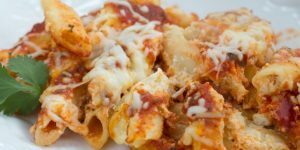 Cheesy Baked Ziti is perfect for those nights when you might be tempted to order pizza or hit the drive thru. Using pasta sauce from a jar saves time, but if you have tomatoes on hand and would rather make your own sauce, you can substitute your preferred recipe. Cheesy Baked Ziti freezes well, so if you’d like you can double the recipe and put one in the freezer. 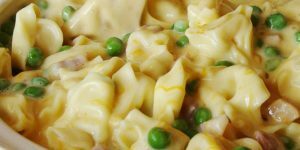 We do a lot of planned leftovers at Menus4Moms, and this is one of our easy leftover ham recipes. Ham and Swiss Sliders are also a good choice for what to make with leftover ham. What some other choices? Take a look at The Ham Plan, a detailed cooking plan for preparing and freezing several hams. 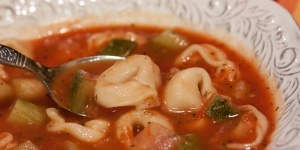 If you prefer to avoid cream soups, try the substitution recipes here or here. 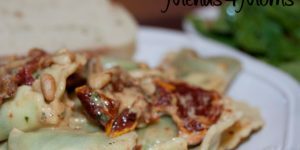 I love the unusual taste of sun-dried tomatoes, and paired with ravioli in cream sauce they are exceptional. I used spinach and cheese ravioli, but cheese or meat ravioli would also work in this dish. You will also need cream, pine nuts, bacon, Parmesan cheese, crushed red pepper, and salt. Tonight’s dinner was supposed to be Chicken Marsala but alas, my distracted nature had me running all over the grocery store for items needed for a science experiment and I didn’t realize until I got home that I forgot to get the mushrooms I needed. I didn’t want to head back to the store so I decided to figure something out using what I had on hand: pasta, a jar of roasted red peppers, grilled and chopped chicken in the freezer, an onion, some bacon, a jar of Alfredo sauce, and a bag of baby spinach that I had planned to use in a salad. 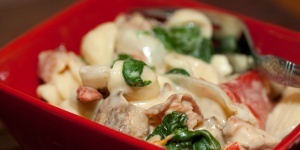 Everyone loved it and the name was voted to be Orecchiette Florentine. Doesn’t it look yummy? If I had to choose the dish I would rather have than any other, it would probably be this one. It combines several of my favorites flavors: balsamic vinegar (which I believe to be The Ultimate Condiment), feta cheese, and grilled chicken. It is a quick and delicious meal that packs a lot of flavor. This easy salad is one of our most requested recipes. 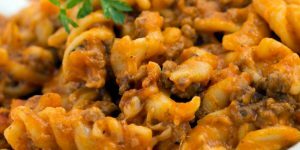 with cool vegetables and warm seasoned beef, it can be served in summer or winter, and using taco meat from the freezer makes it a quick and easy meal. 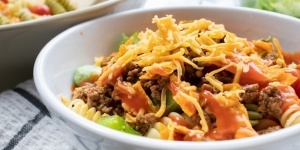 Cheesy Spirals is from the Menus4Moms e-book, Bulk Cooking for the Freezer: Ground Beef and is also featured in the Busy Mom Menu. It is a good recipe to prepare when you buy bulk ground beef. You can brown your beef, use 2 lbs. for the Cheesy Spirals and freeze the rest in 1 lb. portions. The Cheesy Spirals recipe makes 2 pans, one for dinner and one for the freezer. If you have a smaller family and prefer to cook in smaller batches, you can probably get 3- 8"x8" pans out of this recipes instead of 1- 9"x12" pan and 1- 8"x8" pan. This easy and colorful dish is a hit every time I make it. 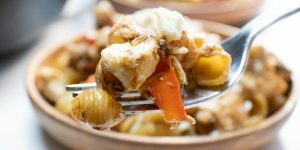 Since my teenager is choosing to eat a vegetarian diet right now, I’ve been using more vegetarian dishes in our personal menus. Since the whole family is not eating vegetarian, I try to accommodate my daughter without forcing the rest of the family to adopt a vegetarian diet.